Welcome to Blueridge Dental! When you walk into our state-of-the-art clinic you may not realize we come from humble beginnings. We’ve been providing dental care in the Blueridge Community of North Vancouver for over 40 years! practice. In 2017 we were thrilled to announce our new and modern home just down the street in the newly developed Northwoods Village. Whether your dental needs involve getting clear braces, natural looking crowns, dental implants or brightening that smile, we promise to provide you with exceptional care! Below are just some of the many procedures and services we regularly provide our patients. An alternative to bridges, partials or complete dentures, dental implants are generally considered the best option for replacing missing teeth. • A dental implant is an artificial root made of titanium metal that is placed into the jawbone to replace the root of the natural tooth. An artificial replacement tooth (or crown) is attached to the implant. Together the dental implant and crown replace the entire tooth. • If you are in good general health, have healthy gums and have enough bone in the jaw to support an implant, dental implants might be right for you. If your jawbone does not have enough bone to support an implant then you may be able to have a bone graft to build up the bone. A bone graft is a way of adding new bone to your jawbone. 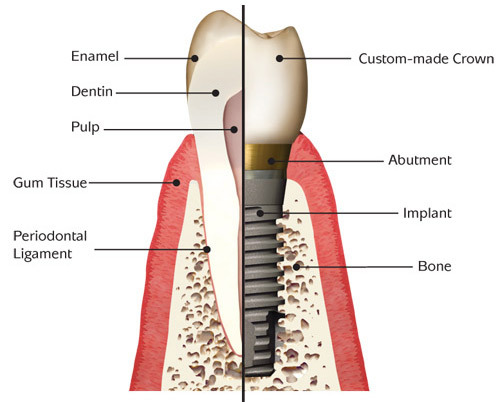 • During the first stage, the dental implant is placed into your jawbone beneath the gum tissue. Over the next several months the implant will physically bond with the bone, a process called Osseointegration. • During the second stage, and once the implant is fully integrated with the bone, a permanent artificial replacement tooth is made and attached to the implant. It may take several appointments to properly fit the replacement tooth to the implant. • Dental implants can support single crowns, bridges, and full fixed or removable dentition. • Much like your natural teeth, implants need to be kept clean using a toothbrush and floss. Regular dental checkups are important to monitor and ensure the long-term success of your implant. • Implants can cost more than other kinds of replacement teeth, and might not be covered by your dental plan, but, in most cases, this is a one-time cost, unlike other kinds of tooth replacement procedures. 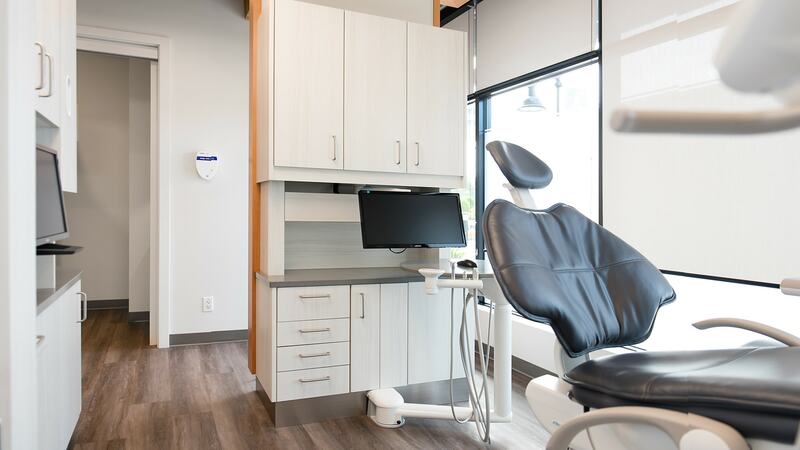 For more information, or if you’d like to schedule an appointment to discuss whether implant dentistry is for you, contact our office today at 604-929-5112. Endodontic treatment, or root canal, is needed when the dental pulp (the living tissue inside the tooth including the nerve and blood vessels) is irreversibly affected by decay or infection. In order to save the tooth the affected pulp, as well as any bacteria and decay are removed, and the resulting space is filled with special, medicated dental materials, which restore the tooth to its full function. Myth 1: Root canal treatment is painful. Decades ago that may have been the case, but with modern technology and anesthetics you won’t experience any more discomfort than if you went to have a cavity filled. The pain from a severe toothache, often caused by damaged tissues in the tooth, can be easily remedied when a dentist removes the damaged tissue through root canal treatment. Myth 2: Root canal treatment causes illness. Information you may find on the Internet or elsewhere, claiming that if you receive a root canal treatment you’re more likely to become ill or contract a disease in the future simply isn’t true. This false claim was based on long-debunked and poorly designed research conducted nearly a century ago, long before modern medicine understood the causes of many diseases. There is no valid, scientific evidence linking root canal treatment to disease elsewhere in the body. Myth 3: It’s better to pull a tooth than have root canal treatment. Saving your natural teeth, if possible, is always the best option. Nothing artificial can replace the look or function of a natural tooth, so it’s important to always consider root canal treatment as an option. Endodontic treatment has a high success rate and many root canal treated teeth last a lifetime. Whether you hope to correct a problematic bite or straighten your teeth solely for cosmetic reasons, Invisalign® orthodontics may be an excellent choice to help you obtain a natural, comfortable smile. 1) It’s virtually invisible. One of the biggest concerns people have when considering orthodontic treatment is the appearance of traditional metal braces. Invisalign can fix most of the same dental problems as traditional metal braces, with the use of clear, easy to use, metal-free trays that are virtually invisible to the naked eye. 2) It’s removable. Although the Invisalign trays must be worn approximately 22 hours per day (compared to 24/7 with traditional braces), they can be removed when needed (e.g. for eating, brushing and flossing, presentations, important meetings, etc.). 3) It’s fast. Treatment usually takes anywhere from 6 to 18 months, depending on patient needs, but most cases are completed within 1 year. Plus, many dental insurance plans cover Invisalign treatment just as they would other orthodontic treatments like conventional braces. If you have a dental emergency, please call us right away at 604-929-5112. We will always do our best to manage your dental emergencies as quickly as possible. Often we can see you on the same day as your emergency. This may mean, however, that we are fitting you into an otherwise full schedule, so sometimes the appointment will only involve diagnosis of the problem and pain control. If we are not able to complete your necessary treatment on the same day as your emergency exam, we will still make every effort to schedule you in for treatment as soon as possible. • If this is an after-hours dental emergency please call us at 604-929-5112 and listen for a contact number for Dr. Reichert. • A fee will apply if the dentist comes to the office specifically to see you for an emergency out of office hours. Nothing is more important for a lifetime of healthy teeth than a happy visit to the dentist. That is why we make creating a positive experience our main goal for these first few appointments. Your child’s first dental visit should be a fun experience where they get to know a little bit about what they can expect when they come to visit the dentist. The Canadian Dental Association suggests that a child’s first dental visit should be “within 6 months of the eruption of the first tooth or by one year of age”. Usually at this early age the dental visit serves two main purposes: for the child to become familiar with the dental team and environment, and for the parent/guardian to speak with the dentist about how to optimize dental care for their child. Although we will always attempt to do a thorough exam during your child’s visit, we allow the child to guide us based on his/her own comfort level. We treat our young patients like little people in charge of themselves and try to involve them as much as we can. A child who feels safe and comfortable will “open wide” and look forward to future visits. Dental care for kids may begin as simply as going for a ride in the chair, watching an older sibling from the sidelines or sitting on mom or dad’s lap. Whatever it takes, it’s worth investing a little time up front to kick off a happy, trusting experience. Usually by the age of 2-3, a child will sit in the chair by themselves and allow us to do an exam and a professional cleaning. When it comes to keeping your kid’s teeth healthy, you and your family deserve a practice that will put your child first. Whitening is a safe, simple and affordable way to transform your smile (into white and radiant). We recommend professional strength whitening because it is generally more effective than over-the-counter, but more importantly, we get a chance to assess whether whitening your teeth is a safe alternative for you. The best way to begin any teeth-whitening regimen is to schedule an appointment and talk to one of our dentists or hygienists about your options. In-office teeth whitening – If you want whiter teeth right away, this is the treatment for you. Treatments are generally completed in one visit, but may require multiple visits depending on how your teeth respond to the whitening gel. At-home teeth whitening with custom whitening trays – If hanging out at the dental office for an hour or so is not your cup of tea, then this system might be for you. After taking impressions of your teeth, we make custom trays and provide a prescription strength whitening gel to apply daily at home for 30 minutes. At-home professional tray whitening generally takes 7 to 14 days, although you may notice results in as little as three to five days. Botox in the dental office??? YES, absolutely! Whether you are seeking Botox treatment for aesthetic or therapeutic reasons the dental office is the perfect place. Dentists are head and neck specialists and understand the anatomy of the head and neck better than most other health care providers. Our intimate understanding of the facial muscles, and our experience in giving injections in sensitive areas of the head, makes us the optimal candidates for administering Botox. The dental office is also a very private place for those who would prefer to be more discreet. If the thought of coming to the dental office causes you fear or anxiety, then sadly you are not alone. We at Blueridge Dental make every effort to understand your specific needs and are committed to the idea that a strong dental team focuses on creating a relaxed and comfortable dental experience at all times. We understand that fear comes in all shapes and sizes; some of the most common sources of dental anxiety come from the fear of: injections, loss of control, insufficient anesthetic, pain, gagging, embarrassment about the condition of teeth, the hand-piece (or drill), noise, or the dentist his/herself. No matter what the source of your dental fear, the Blueridge Dental team will work tirelessly to help you work through your fears. Everyone deserves successful and comfortable dental visits. Although it can be hard to talk about your fears with a stranger, our dental team is professional, experienced, compassionate and non-judgmental. Although we specifically set time aside at every new patient exam to discuss our desire for your comfort, we are always prepared to actively listen to your concerns. We are happy to work with you and tailor your experience in a way that makes you the most comfortable. Most fear originates from the unknown and from a feeling of loss of control. The Blueridge Dental team operates under the policy of informed consent. We will provide you with all of your options and give you all the information you need to choose a treatment that is best suited for you. Should you want more information, or for us to walk you through any or all steps associated with your treatment, we will happily do this. To ensure that you still maintain control over how the appointment progresses, we will together agree on a signal that will tell us if or when you need to stop. The signal that we most commonly use is to simply raise your hand. If your hand is raised at any point during your appointment, we will immediately stop what we are doing and manage your concern. We often recommend bringing in music with headphones or watching something on Netflix on your overhead TV during your appointment. Music and TV can detract your attention and help you to relax. Listening to something with headphones will also help to drown out any of the noises associated with the dental visit. Although we would like to encourage and support our patients so that they do not need to rely on sedation for their visits, if there is no other way to cope, oral sedation offers an excellent option for anxiety management. Please discuss your options with our dental team if oral sedation is something you are interested in. In our experience, most dental fears begin from a young age on. It is our policy to not create a fearful atmosphere for our young patients, nor will we push them beyond their comfort zones in order to complete treatment. For more information or if you’d like to schedule an appointment, contact our office today at 604-929-5112 or email at: info@blueridgedental.ca.